THIS WARRANTY GIVES YOU SPECIFIC LEGAL RIGHTS – YOU MAY ALSO HAVE OTHER RIGHTS WHICH VARY FROM STATE TO STATE. 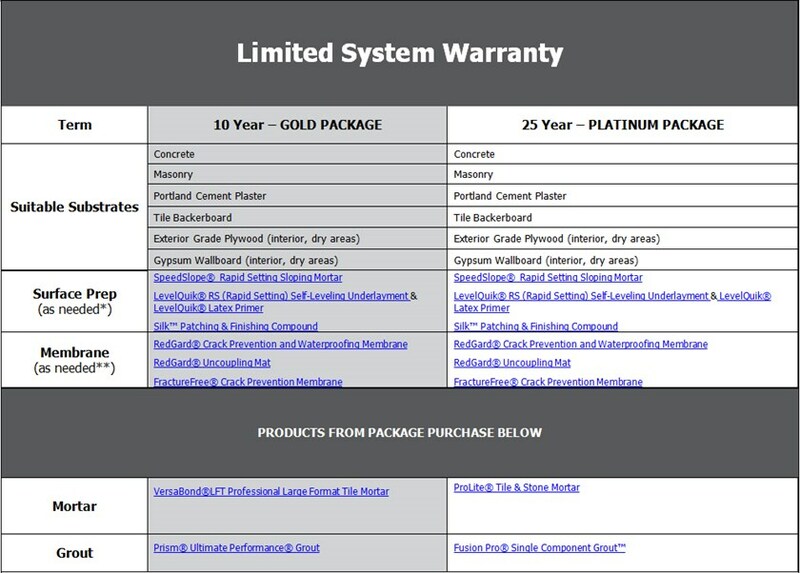 Subject to the conditions and limitations stated in this document, Custom® Building Products (CUSTOM) warrants to the original owner/occupant that the CUSTOM installation system will be free from manufacturing defects and will not break down or deteriorate under normal usage for the term listed in the table below, based on the products selected for the project, when installed in accordance with CUSTOM’s most recently published instructions, specifications and industry standards and guidelines for said installation. This warranty becomes effective upon validated substantial completion of the project. This warranty is not transferable beyond the original occupant. In installations correctly utilizing CUSTOM products selected from each category in the table below, CUSTOM will repair and/or replace, at its discretion, the affected area of the system. Such cost to CUSTOM shall not exceed the original square foot cost of the installation proven to be defective. CUSTOM is not responsible for shade or dye lots of the finish materials. Proof of product purchase is required with any claim. CUSTOM shall not be responsible for structural failure or workmanship that is not in accordance with standard industry practices and procedures and CUSTOM published instructions. CUSTOM will not be liable for any loss or damage arising from the CUSTOM installation system or any CUSTOM product incorporated therein, whether direct, indirect, special, incidental, consequential, regardless of the legal theory asserted, including warranty, contract, negligence or strict product liability. Some states do not allow the exclusion of consequential damages, so these limitations or exclusions may not apply to you. Cracking due to structural movement beyond the engineered design, excessive deflection or other failure of the substrate and damage to structural or subfloor elements from water are also not covered. Acts of God including but not limited to flooding, hurricane, tornado, earthquake and fire shall not be covered under this warranty. CUSTOM will not be responsible for system failure resulting from the use of competitive or non-specified products. CUSTOM shall not be responsible for lippage between tiles; cracks in tiles; loss of bond to substrate, tile or membrane due to excessive tile deformation such as warpage or curling for any reason, or resulting from a lack of improperly-placed perimeter and/or movement joints. All tile installed over post-tensioned or suspended slabs must be physically strong to accommodate movement without cracking or spalling, such as true porcelain tile. The potential for efflorescence and shading is inherent in all cementitious products and is not considered a manufacturing defect. Although CUSTOM may have suggested the material or developed the material at the request of the owner or applicator, it is the responsibility of the owner to test and determine the suitability of the material for the intended use and purpose, and the owner assumes all risk and liability whatsoever regarding such suitability. This warranty is in place of all other warranties and conditions, express or implied. Custom expressly disclaims any other warranties and conditions, including statutory warranties and conditions and warranties and conditions of merchantability and fitness for a particular purpose other than the warranty expressly stated herein. 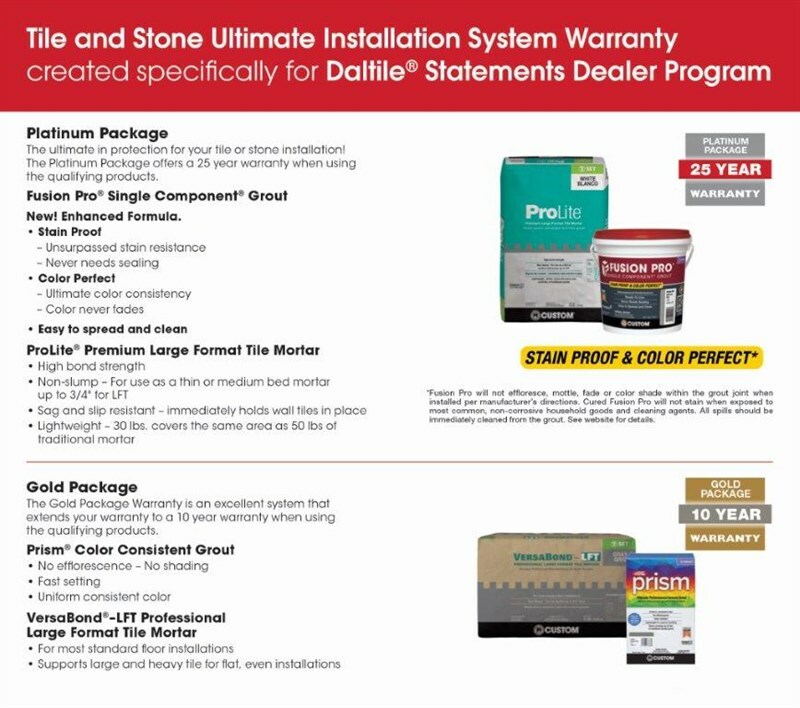 A complete CUSTOM system of products must be used including mortars and grouts where applicable to qualify for this limited warranty. Surface preparation product selection is optional depending on the job requirements. Multiple residence installations are considered as one installation. To make a claim under this limited warranty, notify CUSTOM immediately in writing at: Technical Services, Custom Building Products 10400 Pioneer Blvd., Santa Fe Springs, CA 90670. Include any and all information related to an alleged defect of the installation. The claim must be submitted in a timely fashion, and evaluated by CUSTOM before any repair work is done. CUSTOM reserves the right to physically inspect any project with a claim pending prior to determining validity of the claim. Proof of purchase may be required.